Psychologist Kieron O’Connor has compiled a list 30 pages long of different objects he has seen hoarders accumulate. The list includes newspapers, empty cornflake packages and toilet paper rolls. 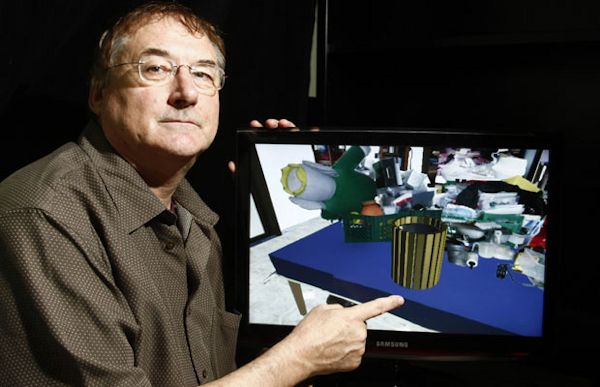 O’Connor, with two colleagues, is studying whether virtual reality could be a possible treatment for hoarding. It is believed to be the first study of its kind in Canada. It takes place at the University of Quebec Outaouais (UQO) in Gatineau. The university is one of the few in North America doing research in cyberpsychology. In the early 1990s, clinical psychologists recognized the potential of virtual reality and began incorporating it into their practices. It has helped people overcome fear of heights and spiders, for example. The study takes place in a small office at the university equipped with a computer on a table and an ergonomic office chair, surrounded by a black velvet curtain. Study subjects can also try 3-D vision goggles for a hyper-realistic experience. But it can cause cyber-sickness because the environment moves with head movements. “Even without the goggles, the enclosed space and monitor are just as good,” O’Connor says. A generic home interior is loaded with images from the person’s home to create the virtual environment. The subject practises throwing things out; first by clicking and dragging an object into a bin on the computer and then doing the same action at home in real life. People tend to feel uncomfortable. “They have great difficulty saying goodbye,” he says. “If they feel anxious, we see how long it lasts and how with habituation the feeling decreases. The participants get to see what a tidy house looks like. Most have become almost blind to their clutter. “It’s hard for them to imagine what the space will be like.” Most hoarders seek treatment only when there is a crisis, such as threat of eviction, a cleanup order from public health officials or family breakdown. One woman in O’Connor’s therapy group in Montreal has lost her family; her husband and children went to live in another house. He knows of people who rent storage spaces for their overflow or live elsewhere while maintaining a house filled with clutter. The age of attendees ranges from 25 to 71. They include teachers, a bookseller, a social worker, a repairman and a nurse. The study is sponsored by the Canada Foundation for Innovation. So far, five people are in the study and O’Connor plans to recruit another 10. It wraps up at the end of the year. About this series: Almost all of us have too much stuff, but hoarders acquire — and keep — way too much. Their compulsion breaks up families and is hazardous to health and safety. Hoarding has been called “the disorder of the decade.” And it could soon be classified as a psychiatric illness. If you have a concern about hoarding, one place to call is the City of Ottawa public health unit.